Before learning the methods of voltage control in power system, we must first understand why do we need to control voltage. In power systems, voltage is supposed to be constant which is obviously not. So we have to control it in such a way that it remains constant. But why does the voltage need to be constant at all? Because, most of the devices, apparatus, electrical machines, consumer appliances etc. are all designed to work at a specified voltage. Wide variations of voltage may cause errors in operation, malfunctioning or performance deterioration. It is desirable that the consumers receive power at substantially constant voltage. In many countries, including India, the statutory limit of voltage variation is ±6% of the declared voltage at consumers' end. Therefore, it is important to apply certain techniques, certain methods to control the power system voltage to keep it constant. Following are the methods of voltage control in power system. An automatic voltage regulator detects the terminal voltage and compares it with the reference voltage. The difference between detected voltage and given reference voltage is called as the error voltage. The regulator then controls the excitation voltage of the alternator to cancel out the error voltage. Thus, an automatic voltage regulator controls the voltage by controlling the excitation. Excitation control method is satisfactory only for short lines. For longer lines, the terminal voltage of alternator has to be varied widely for the voltage at far ends to remain constant. Obviously, this method is not feasible for longer lines. The voltage control in transmission and distribution systems is usually obtained by using tap changing transformers. In this method, the voltage in the line is adjusted by changing the secondary EMF of the transformer by varying the number of secondary turns. Secondary voltage of a transformer is directly proportional to the number of secondary turns. Thus, the secondary voltage can be adjusted by changing the turns ratio of the transformer. Secondary number of turns can be varied with the help of tappings provided on the winding. Basically, there are two types of tap changing transformers. In this method, the transformer is disconnected from the supply before changing the tap. Off load tap changing transformers are relatively cheaper. But the main drawback with them is that the power supply is interrupted while changing the tap. In modern power system, continuity of the supply is important. Therefore, on-load tap changing transformers are preferred to control the voltage. An induction regulator is basically an electrical machine somewhat similar to an induction motor, except that the rotor is not allowed to rotate continuously. The rotor of induction regulator holds primary (excitation) winding which is connected across (parallel) the supply voltage. The stationary secondary winding is connected in series with the line which is to be regulated. From electrical point of view, it is immaterial whether primary winding is rotating or secondary winding is rotating. The magnitude of voltage in the secondary winding depends upon its position with respect to the primary winding. Thus, the secondary voltage can be adjusted by rotating the primary winding. 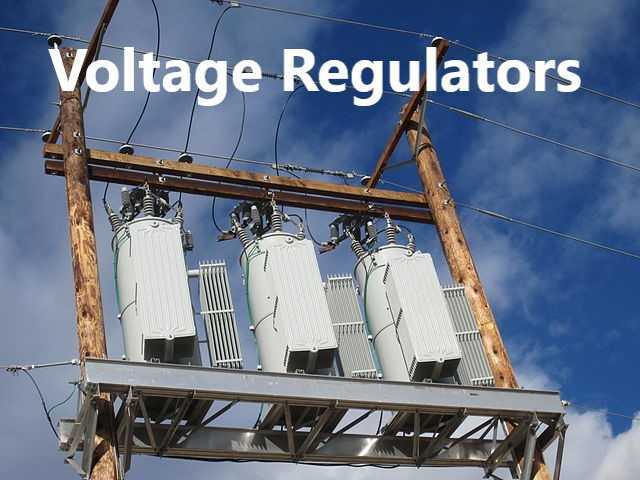 Induction voltage regulators were used to control voltage of electrical network in earlier days, but they are now replaced by tap changing transformers. Shunt reactors are basically inductive elements that are provided at sending end and receiving end of long EHV and UHV transmission lines. When a transmission line is not loaded or lightly loaded, the line capacitance predominates and receiving end voltage becomes greater than the sending end voltage. This effect is known as Ferranti effect. In such situation, shunt reactors are switched in the line. Shunt reactors compensate the line capacitance and, hence, control the voltage. Shunt capacitors are usually installed at the receiving end substations or near industrial loads. Most of the industrial loads draw inductive current and therefore the power factor is lagging (usually 0.3 to 0.6 lag). The line experiences IXL drop due to this lagging current. Switching in shunt capacitors compensate this inductive reactance, thereby, decreasing the IXL drop. Thus, shunt capacitors can be used to control the line voltage when the load is highly inductive. A synchronous condenser is basically an over-excited synchronous motor running on no-load. Synchronous condensers are also called as synchronous phase modifiers. A synchronous condenser is located near the load end and can inject or absorb reactive power. And, thus, a synchronous phase modifier improves the voltage profile.